Baseball in the late 19th century was a rough-and-tumble, take-no-prisoners type of game. The National League Cleveland Spiders exemplified this brand of rowdy play. Aside from their aggressive tactics on the field, the Cleveland club had a well-deserved reputation for bullying umpires. On June 15, 1894, the visiting Cleveland Spiders (24-14) played the Brooklyn Grooms (23-16) at Eastern Park in Brooklyn in front of 3,207 fans. It was the second game of a three-game series between the two teams. The Grooms had been hot in June winning eight of their last ten contests with one tie. The Cleveland club was playing .500 ball over that same period of time. Brooklyn player-manager Dave Foutz named Ed Stein as his starting pitcher. Stein, who had been pitching in the big leagues since 1890, had a major-league record of 65-43 entering the 1894 campaign. On June 2 he had tossed a no-hitter against Cap Anson’s Chicago Colts in a rain-shortened six-inning contest. Brooklyn pitcher Ed Stein started the game against Cleveland by walking Cupid Childs. As the next batter, Jesse Burkett, stepped up to the plate, it didn’t take long for the Spiders to revert to their old ways. After taking the second of two called strikes, Burkett slammed his bat on the ground in disgust in an attempt to intimidate umpire Jack Hartley, who was making his major-league debut. Burkett then reached first after smashing a hard shot through shortstop Tommy Corcoran. Ed McKean followed with a bouncer to Corcoran, who threw the ball past Tom Daly at second. Childs scored while Burkett and McKean moved up a base. Buck Ewing popped up to center for the second out. Patsy Tebeau was up next and he tried the same tactics on Hartley as Burkett, but the rookie arbiter remained unfazed. In regard to Tebeau’s antics, the Brooklyn Daily Eagle observed, “Captain Tebeau’s kicking consists of walking majestically up to the plate and glaring untold things at the umpire. His glares are thrown away at Mr. Hartley.”3 After failing to rattle Hartley, Tebeau singled to right, knocking in Burkett. Ed McKean was thrown out trying to score from second on the play by right fielder Oyster Burns. Chippy McGarr was put out to end the inning, with the Spiders leading, 2-0. Daly opened the Brooklyn half of the first by working a walk off Lyston, who was pitching despite the warning from Nick Young. Corcoran followed with a towering fly ball to center that Jimmy McAleer, one of the best outfielders in the league, muffed for an error. The next hitter, George Treadway, lined to McAleer for the first out. Lyston issued a free pass to Mike Griffin, which loaded the bases. Billy Shindle lofted a sacrifice fly to right that scored Daly, then Burns popped out to catcher Chief Zimmer for the third out. In the next inning the Spiders plated two more runs to take a 4-1 lead. Lyston held Brooklyn scoreless in the bottom of the second with Stein returning the favor in the top of the third. A miscue by shortstop Ed McKean led to another Grooms tally in the home half of the inning. The Spiders plated a pair in the top of the fourth on Jesse Burkett’s opposite-field home run, which the New York Evening World described as “the longest ever made inside these grounds.”4 Cleveland led 6-2. After giving up two runs in the bottom of the fourth, Lyston was removed in favor of John Clarkson with two men on and two out. Clarkson was a 12-year major-league veteran who was a 53-game winner in 1885. He entered the 1894 season with a lifetime record of 320-168. Griffin greeted Clarkson with a long three-run homer, giving the Grooms a 7-6 lead. According to the Brooklyn Eagle, the ball was headed in the direction of Brownsville, the neighborhood that surrounded the ballpark.5 Clarkson gave up another single before working his way out of the jam. After Cleveland failed to score in the top of the fifth, Brooklyn catcher Tom Kinslow pounced on a hanging curve from Clarkson, blasting the ball deep to left field for a solo home run and giving the Grooms an 8-6 lead. The Evening World noted, “Kinlsow’s home run drive into the carriage field was perhaps the longest hit ever made from a pitched ball in the Eastern Park Grounds.”6 Chasing Kinslow’s drive, Jimmy McAleer sprained his ankle on the bicycle track that encircled the outfield. Jack O’Connor was called in from the Cleveland bench to replace McAleer. The Spiders scored a run in the sixth on an unusual play. A walk to Zimmer followed by a single by Clarkson and another base on balls to Childs loaded the bases with none out. Burkett smacked a grounder to third baseman Shindle, who stepped on the bag for the first out before firing to Kinslow at home to complete the twin killing. Thinking he had a play on Childs at second, Kinslow threw to Corcoran covering the bag. The ball sailed into center field, allowing Childs to race all the way home, cutting the Brooklyn lead to one run at 8-7. The Grooms failed to score in their next at-bat. After Stein tossed a goose egg in Cleveland’s half of the seventh the Brooklyn pitcher, who had tripled in the fourth inning, connected for an RBI double that put the Grooms up by two, 9-7. The Spiders countered with a lone marker in the eighth on a Jack O’Connor four-bagger to left field. The ball took a high bounce off the bicycle track, enabling the Irishman to circle the bases. With two down Childs smacked a ball past Treadway in left but was gunned out at the plate, on what would’ve been the tying run, on a strong relay throw from Tom Daly, and Brooklyn led, 9-8. Twenty-seven-year old Cy Young, who was 11-6 going into this game, relieved Clarkson in the eighth and held Brooklyn scoreless. Cleveland could do nothing else with Stein’s deliveries, the four-home-run slugfest giving Brooklyn a 9-8 victory. This would be Lyston’s only appearance with the Spiders. Tebeau evidently didn’t want to incur the wrath of Nick Young by using him in any more games until an agreement was reached with Peoria. Six weeks later the Cumberland Evening News noted that the situation had been resolved: “The Cleveland League (team) have perfected their arrangements with Peoria and have called on Pitcher Lyston to be ready for service at any time.”7 By that time Jack Lyston had signed with an independent semipro team in Cumberland, Maryland. He never returned to the Spiders. Brooklyn (70-61) finished the 1894 season in fifth place. Cleveland was next in the standings with a record of 68-61. Cleveland had four future Hall of Famers in the lineup for this game: Jesse Burkett, Buck Ewing, John Clarkson, and Cy Young. Spiders pitcher John “Jack” Lyston is the author’s great-grandfather. This game was originally credited to William Edward “Bill” Lyston in Total Baseball and other early baseball encyclopedias. Bill, John’s brother, was a minor-league catcher-infielder-outfielder in the late 19th century. In early 2000 the author, who was not yet a member of SABR, began searching newspapers on microfilm at the Enoch Pratt Free Library in Baltimore to determine which Lyston pitched the Spiders game in 1894. The author eventually found an article in the June 14, 1894, edition of the Baltimore Morning Herald noting that it was Jack, not Bill, who signed with Cleveland. The information was forwarded to 19th century baseball researcher Reed Howard, who made it available to SABR’s Biographical Committee. The New York Evening World and the Brooklyn Daily Eagle have conflicting accounts of some of the plays that occurred during this game. Because the Daily Eagle was the newspaper of the home team, the author used its version in the article. 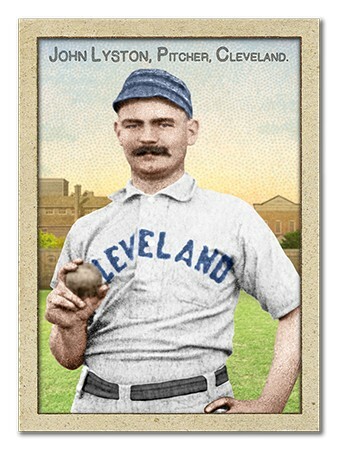 I would like to thank Jesse Loving at arslongaartcards.com for creating the John Lyston baseball cards. Keenan, Jimmy. The Lystons: A Story of One Baltimore Family and Our National Pastime (Self-published, 2009). Phillips, John. The 1894 Cleveland Spiders: (Cabin John, Maryland: Capitol Publishing, 1991). 1 Lee Allen, The National League Story: The Official History (New York: Hill and Wang, 1961), 72. 2 Baltimore Morning Herald, June 14, 1894, 3. 3 Brooklyn Daily Eagle, June 16, 1894, 5. 4 New York Evening World, June 15, 1894, SE1. 5 Brooklyn Daily Eagle, June 16, 1894, 5. 6 New York Evening World, June 16, 1894, 7. 7 Cumberland (Maryland) Evening News, July 27, 1894.